GTA is one of the most graphical and addictive game in PC,now available for android mobiles and tablets,there are many difficult levals in to win.Now it is possible to enter codes or keys also mobile phones and Android tablets , although we will have to do some trick,redundant,write for the screen. If you have ever wondered how the tricks are introduced into a GTA for Android , we explain the simplest way: pair a Bluetooth keyboard with mobile or tablet, if supported, use a USB keyboard using the OTG function certain devices. Just type any of the tricks of the game at some point to activate applying the changes you want. From infinite to override the ammunition police search, the list of big improvements. 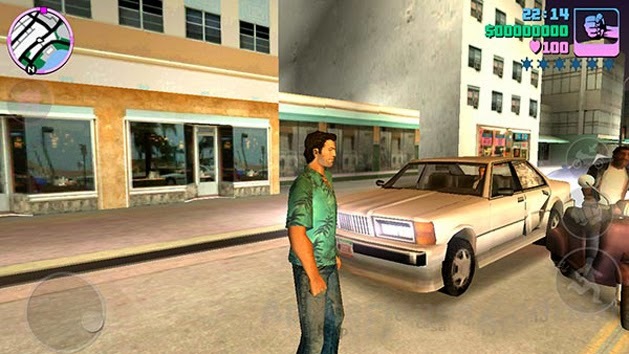 now the tricks are only compatible with GTA 3 and GTA: Vice City , not being activated in GTA: San Andreas . We assume that Rockstar 's activated at some later game update, so it is worth going there trying to see if they work. We have seen direct way to write code with a keyboard , but more often is that we have no support. Luckily, you can activate a virtual onscreen keyboard that works in any application that does not allow these types of keyboards, like GTA . Simply install cheatcode Keyboard from the picture below (priced at around 70 cents) and have access to the keyboard whenever we want (after you turn on Android and select it as default). It comes preloaded with all the tricks of GTA 3 and GTA: Vice City for Android , plus we can write our own code to execute with a single click. cheatcode Keyboard is a really handy app if such aid commandments in games. PROFESSIONALSKIT : Segundo weapon set. FULLCLIP : Infinite Ammo without recharging. TURNUPTHEHEAT : Increases the level 2 star. TURNDOWNTHEHEAT : Deletes the stars of a police search. AEZAKMI : Immune to crime Mode. BRINGITON : level 6 star police search. HELLOLADIES : Maximum physical attractiveness. PROFESSIONALKILLER : How professional murderer. NATURALTALENT : Maximum driving experience. Do you have more Cheate codes for GTA ? You can freely share in the comments.